Minessence Values Framework [MVF] Knowledge-Base: What is Brain-Preference? 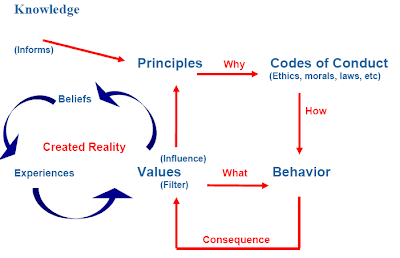 How does it impact on our Values and Communication Styles? Unconsciously, the processes people use to make decisions and to communicate with the world around them, are selected so as to reinforce their identity. 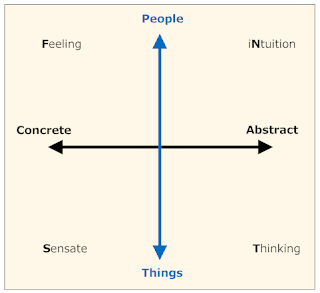 A significant part of people's identity is shaped by deep preferences which arise from the way our sensory [S], feeling [F], thinking [T] and intuitive [N] modalities are "wired" in our "firmware". These deep preferences are termed Brain-Preferences. Using a computer metaphor of the brain (Figure 1) there are essentually three levels of flexibility/plasticity. At the base level is the hardware--the brain we are "stuck" with. This level people, such as William Glasser, argue is the source of our basic needs: fun, love, freedom and the need to feel in control of our life. These needs are common to all humanity--they are hardwired into us. All computers have essentially the same hardware. The difference between how computers and people operate comes from the "wiring" at the firmware level. For example, what makes an Apple computer different from a PC, or an iPhone different to a Nokia is the basic operating system programmed into the firmware--this programming can be changed but not easily and normally is only changed in minor ways to provide necessary upgrades or to fix issues. Firmware wiring creates basic "personality" differences--an Apple is more intuitive and graphically oriented than is a PC which is more "left-brained" rational. With people the firmware determines whether a person has a preference for people or things and whether they have a preference for dealing with concrete or abstract realities. At the software level reside applications (APPS). Both PC and Apple computers can run sumilar APPS but the firmware determines which computer type is best suited for which APP. In people, it's our worldview which resides at the software level. Our firmware determines how we create this worldview. 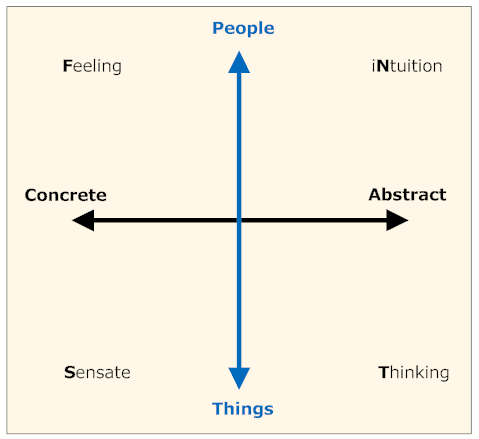 A person whose firmware predisposes them to talk and listen to people in a detailed concrete way will obviously create a different view of the world as compared to a person whose firmware predisposes them to them to dialoguing with the world via "tinkering" with things and formulating abstract models of how things work. Figure 3 has more detail about the nature of a person's preferred mode of dialogue with the world around them depending on their brain-preference. Technical Architect [Things-Abstract]. These are people who have a preference for using their hands to "tinker" with or to create things and who use their intellect to develop models or plans. They rely mostly on understanding the world through thinking and intellectual analysis. Their style of Decision Making favors rational analysis. Since they prefer to gather information visually, they communicate best through illustrations and graphic representations. Technical Architects seek careers as planners, software developers, composers, architects, etc. They are more likely to be corporatists or independents who see political parties as a hindrance to them following their passion. Technical Architects will often create or deploy new technologies. Those who have this brain-preference are often perceived as Visionary Leaders if the technology they have created is widely adopted. In a sense, this can make them accidental leaders because their passion is the technology, rather than the leadership. Quality Producer/Crafts Person [Things-Concrete]. These are "hands on", sensate people who like certainty and desire activities/organizations to be well structured. They prefer things that are down-to-earth, rather than abstract and intangible. They prefer having or creating a manual for how things are done. They are uncomfortable around people who seem erratic or chaotic in the way they do things. Their Decision Making Style tends to be prudent and conservative, based on carefully gathering detailed information. Their Communication Style focuses on careful documentation of details and linear, sequential processes. Quality Produces gravitate towards careers such as athletes, mechanics, surgeons, gardeners, accountants, farmers, etc. They are most likely to support a political party which puts balancing the budget ahead of social welfare. Quality Producers can be excellent Transactional Leaders. People Servants [People-Concrete]. Similar to Quality Producers, People Servants like structure and a degree of certainty. However, they strongly prefer spending time with and talking to people, rather than relating to the world of things. They prefer to communicate via intimate, feeling based language and dialogue and are usually good listeners. People Servants strongly favor a style of Decision Making that considers people’s feelings and preserves relationships. People Servants often choose careers as school teachers, coaches, therapists, healthcare and human resource professionals, actors, value consultants, etc. They are more likely to support a political party which puts caring for people ahead of balancing the budget. People Servants can be great Facilitative Leaders. In that role they can facilitate the difficult dialogues and mediate conflicts that frequently emerge between the Visionary Leaders and Transactional Leaders in organizations. Social Architects are often society’s "greens", deep ecologists, social-activists, social scientists, social policy planners, organizational consultants, writers, etc. They are potential Visionary Leaders in societal and organizational transformation. To be effective, Visionary Leaders, like Facilitative Leaders, understand that the key to change is first gaining genuine rapport with people. Because 40 of the 128 values are correlated to brain-preference, we are able to map people on a brain-preference chart as shown in Figure 4. As you can see from the legend, person 3 on the chart is me which indicates that I have a strong preference for the abstract and a slight preference for people over things. Person 2 is similar to myself, however, is virtually indifferent as to whether they prefer working with people or things. Person 1 has no strong preference--we usually find people who lack preferences are in a state of transition in their life--in some senses they are in a process of breaking free from the "shackles" of their past and becoming their own person. See also: "Scientists Are Beginning to Figure Out Why Conservatives Are…Conservative"